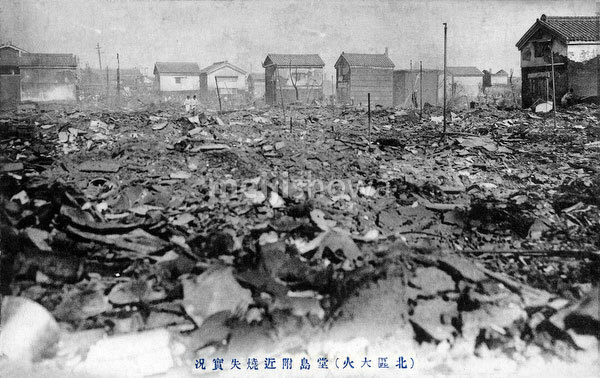 The area around Dojima after the Great Kita Fire (キタの大火, Kita no Taika) of July 31, 1909 (Meiji 42) in Osaka. The fire destroyed 14,067 houses and buildings and became the impetus for the creation of the Osaka fire fighting dept. As a result of the fire glass lamps were banned and replaced by metal ones, and the authorities began promoting the use of electricity. See blog entry.